Coopetition Among Whales | Enjoy Life and Do Good! I recently went on a whale-watching expedition while on an Alaskan cruise. We had seen one or two whales in the distance, blowing water high into the air, arching their backs just above water then diving with their tails flipping up as if to wave. The tour guide told us that whales are usually solitary creatures that travel alone. He explained that these whales don’t have big sharp teeth but their throats expand to take in lots of water then they use their tongue to press the water out and keep the small fish in, sort of like a French press filtering coffee. Suddenly he seemed excited. Seeing another whale watching boat up ahead he said that they must have spotted something interesting and we’d go up and see what they were looking at. Once near the other boat we could see a cluster of about ten whales not far from the coast. The guide explained that the whales were bubble-netting. We watched and snapped photos as the whales circled closely in a tightly choreographed dance. Circling, blowing, diving and waving their tails. He explained that sometimes the whales work together to create a net of bubbles to trap a large school of small fish. They blow a big circle of bubbles, some dive deep and make noise to drive the fish toward the surface of the water. All the whales take big gulps of water capturing more fish together than they could individually. It was a beautiful sight to see. This apparently isn’t uncommon but something about this year’s weather had made it unnecessary for the whales to use this technique much recently. He said he’d only seen it about four times this season. Seeing the whale’s bubble-netting technique reminded me of the term ‘coopetition.’ Cooperative competition. The whales, all feeding on fish, were working together to scare up the fish so they’d each have a good meal rather than trying to drive each other away to have the school of fish to themselves. The whale-watching boats were working together, too. While they have the same target market of tourists from the cruise ships. Each wanted to give their passengers a grand experience of whale-watching so they shared the space. In my business of speaking and writing I’ve seen lots of coopetition. Speakers and writers sharing tips, generous with advice and mentoring others. What about your business? Is there coopetition or vicious competition? Is it win-win or win-lose? 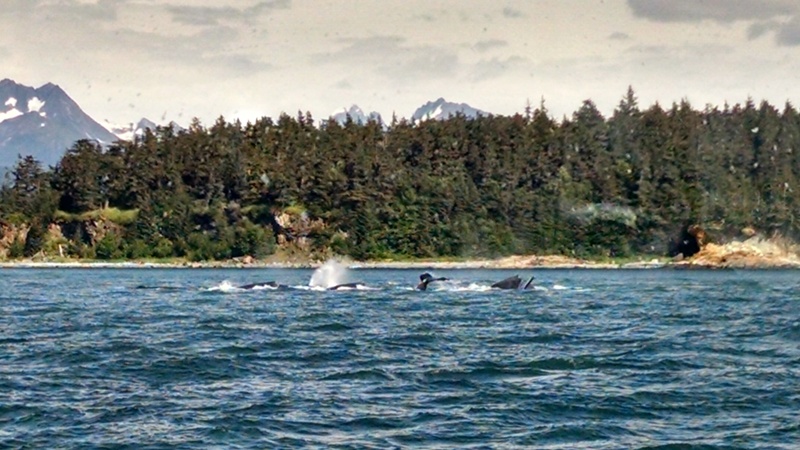 This entry was posted in Highrise Life and tagged adventure, alaska, blogs, business relationships, speaking, whales, writing by Myra McElhaney. Bookmark the permalink.